Earlwood. A fascinating and invigorating Greek culture with food to amaze and delight the senses. Truly a worldly city in Sydney’s own backyard. All this and more on your door step so what’s holding you back? If the answer is back or neck pain then you need Sydney Wide Chiropractic to open up a whole new world of improved health and wellness. 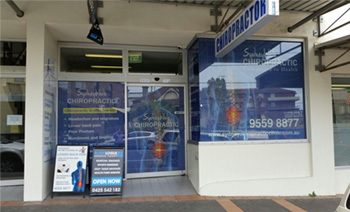 Our team of university trained and clinically experienced professionals are ready to help with your pain, from back and neck through to headaches and chronic pain, and have a deep understanding of the spinal system that has propelled us to leaders of our field as chiropractors in Earlwood. Your body is a self-healing and self-regulating piece of machinery that can be thrown off course due to the stresses and demands of a fast paced modern lifestyle. Your nervous system controls everything you do and is at the centre of your vitality. Dealing with back and neck pain are the most common signs of disruption in your bodies processes and when it comes to healing your body you need to turn to the best, and for the last 11 years in the Inner West we have been there. Your chiropractor in Earlwood can help you regain your wellness through coordinated and effective treatment programs designed to suit your individual needs. We understand everybody is different and that is at the core of what we do, finding individual solutions to restore effective and lasting communication between your brain and body, because your health will always starts with you, but it will thrive with us. Our state of the art techniques combine a safe and natural treatment with new technology that has led us to the forefront of the industry as a chiropractor in Earlwood and encourage your body to revert to it’s own natural healing state, giving you the secrets to success. So if you’re ready to wake up to a whole new world of health and vitality then call us today on (02) 9559 8877 or email us at info@sydneychiropracticclinic.com.au and organise your treatment today.